After discovering that four people sleeping the van wasn’t a viable option for, well, anytime really, we made the easy decision to trawl through Airbnb’s to find a place to stay in Berlin. The crammed sleeping arrangement we attempted in the Tropical Paradise carpark didn’t only lead to collective grumpiness from the sub-standard slumber but a lot of sore bones and so we quickly found a nice-looking place in the cultural Prenzlauer Berg district that would accommodate us in relative luxury, and there was even a piano for Bani to entertain us on. The area made an instant impression with the graffiti and landscape suggesting a hippie air to the neighbourhood, which made me feel right at home in the van, an aura incarnated by the bicycle shop owner whose workshop we parked outside. The ragged, dreadlocked man turned out to be a fellow VW van owner, and naturally was drawn outside for a chat about our trip and my van and he even let me hook it up to his mains to charge the batteries. Something that was a necessary precaution due to the potential dynamo fault, something that turned out to be a loose wire, most likely kicked out by Charlie after he slept on the front seat (four in the van really wasn’t practical). The block of flats was suitably quirky and in keeping with the laidback aesthetic of the area, with a clowder of cats running around the courtyard, a vintage, colourful canoe in the corner and a couple of old ladies nattering as they played table tennis- they probably owned all the cats. 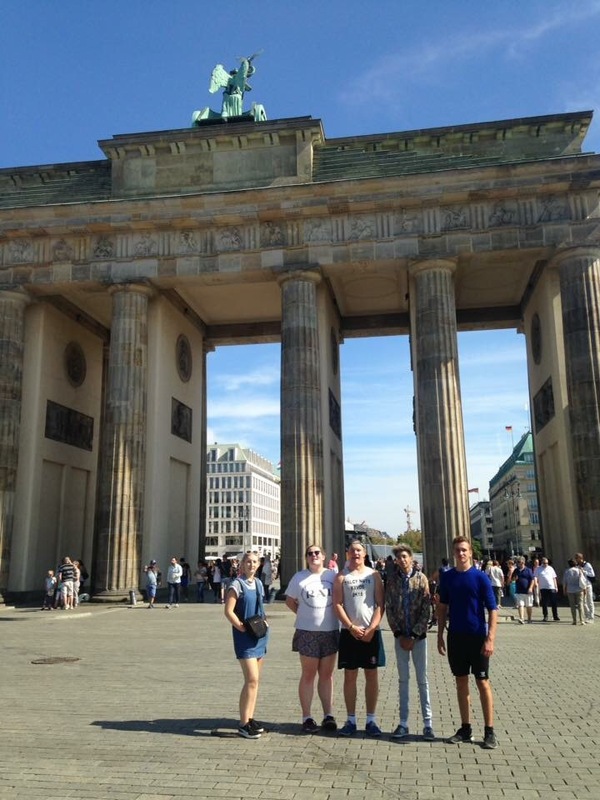 As well as the plethora of historic monuments, inspiring buildings and rich culture, there was also an incredible group of friends out in Berlin who had flown out to the German capital to join us in experiencing both the fascinating sites and nightlife. And it also just happened that I would be spending my birthday out there with them and they would be there to help me celebrate turning nineteen. As we were well rested after our therapeutic day in the waterpark we were keen to reunite with our visitors and embrace the German beers and so set off to their hostel. I like to believe I have a good sense of direction and after driving through the city I backed myself to guide us to their accommodation, and after a quick bus journey we arrived at the happy hostel to discover that they weren’t there. This was not because they had popped out to get started on the steins, but because it was the wrong hostel leaving me guilty of leading us to the wrong place entirely. Obviously, I shifted the blame onto Bani, the trip navigator and claimed I had got us to somewhere I thought was the right place very successful in a plea of redemption, but the guys were having none of it. Bani resumed control of guidance and changing to the subway we arrived at the happy bed hostel- you can see where I went wrong. As you can imagine the reunification of a group of eighteen-year olds in Berlin became quite a jolly affair, after all I hadn’t seen some people for months after seeing them pretty much every day before I left. Catching up with each other’s summers over a few beers escalated into quite a lot of beers before we ventured out of the dorm. However, my night didn’t leave the confines of the room as one of the girls I had a particular affection for had over indulged in her vodka and so I took a duty of care as she regurgitated the alcohol into the toilet, before crashing in the room till the next morning. Waking up in the hostel did come with the benefits of a free breakfast as well as being in the middle of the city with some of the biggest attractions on its door step. I even had a fresh set of clothes from the care package my mum sent out with one of the girls to change into, and the day started on the right foot. My good mood lasted all day as we explored the city, stopping first at Brandenburg Gate (not Battenberg gate- and there were no cakes involved). The 18th century triumphal arch was originally commissioned by King Frederik William II as a sign of peace, but is notorious for being a symbol of the division of Germany as it was made inaccessible to both sides of the Berlin Wall. 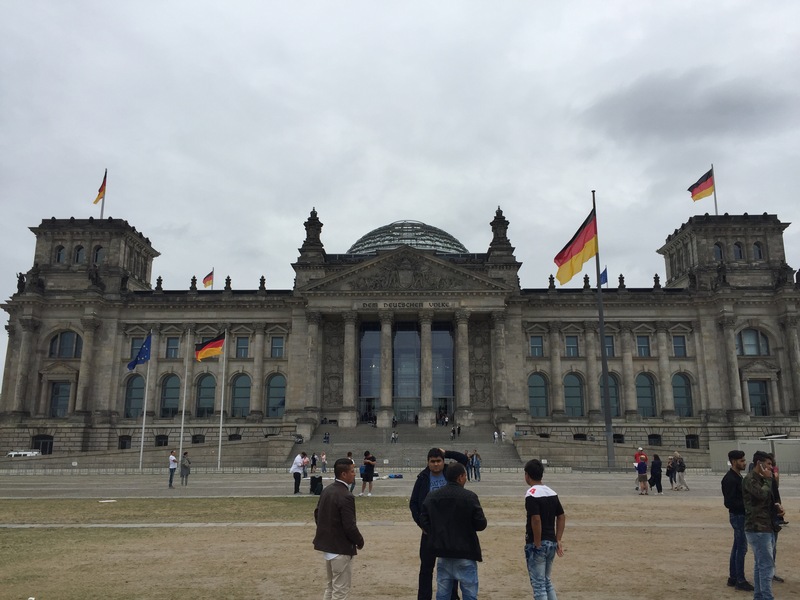 Nearby is the Reichstag, Germany’s grand government building know to any GCSE history student for the fire in 1933, which Hitler used to increase his power by blaming the communist and socialist parties for the decimation of a national symbol. The building remained empty until the reunification of Germany and wasn’t the home of the parliament again until 1999. Whilst visiting I even bumped into Angela Merkel outside and a had a quick chat and even got a hug- as it was the waxwork model. 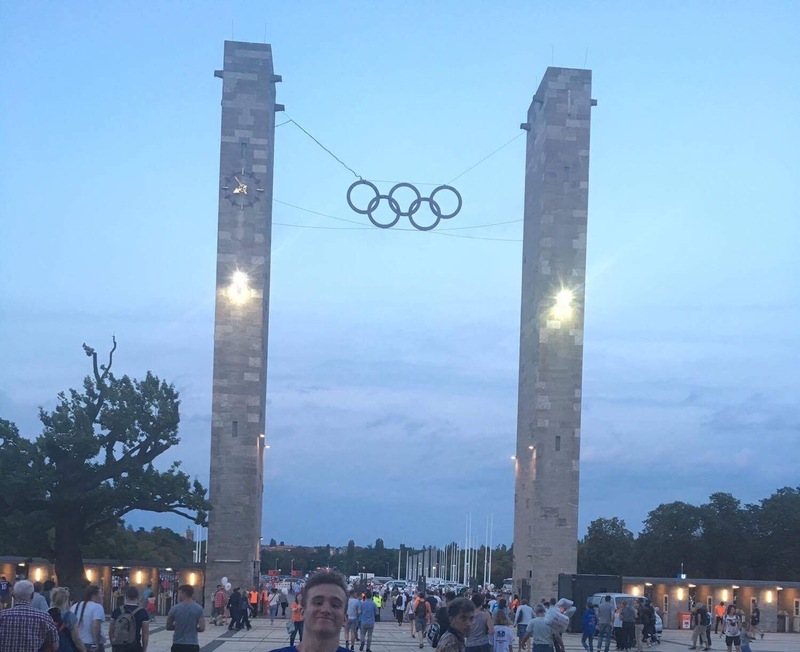 Our final stop of note was the Olympic Stadium as we got tickets to the diamond league athletics competition and enjoyed the afternoon in the sun, watching the honed athletes as we feasted on steins and schnitzels. No one came close a Jesse Owen’s level performance at the site where he proved Hitler’s dominant race theory wrong when he became the first America track and field athlete to win four gold medals all at the same Olympic games, although he still wasn’t invited to Whitehouse on his return to the states to shake the President’s hand. I love my vw, we took ours to italy with the kids last year and a trip round devon and dorset this year. Buy one! You won’t regret it. Liked your post on traveling to Berlin , and as an American , I love the fact that you know something about our sad history of race relations. True Hitler didn’t shake Jesse Owens hand, but then neither did the President of the United States when he got back.